Having recently reviewed this band's first single, and raved about it, I had high hopes for the album. The eponymous debut lives up to expectation. 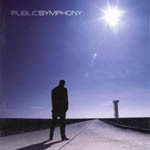 'Public Symphony' is a superb blend of stirring choruses, electronica, chill-out and prog. Imagine Coldplay, Pink Floyd and Massive Attack at a party gatecrashed by Ian Brown, and you'll be getting the plot. This album could, with the right promotion, be an absolute monster. Already the band have picked up awards Stateside for best unsigned band and album. And they're already spreading the word via that great viral marketing tool, the Internet. 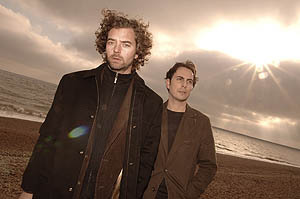 The band is essentially duo Dobs Vye (who looks like a more hairy Chris Martin) and James Reynolds who wrote and produced the album. Each track is superbly crafted and the album beautifully sequenced. It starts kicking in with 'Children of the Heatwave' and 'White Dove'. 'Children of the Heatwave' has one helluva funky groove which betrays Reynolds' dance mix background, led by Fender Rhodes wah-wah and like Lonnie Liston Smith on speed. 'White Dove' is similarly infectious, lovely Air-like burblings and wonderful rhythms defy you to remain static in your rocking chair. 'Touch' is unashamedly Floyed-esque and reprises 'The Great Gig In The Sky' with Yvonne John-Lewis in the Clare Torry role. It is probably invidious to pick out highlights because, frankly, there are so many. If you've heard the track 'Stronger' you'll know what we're talking about. 'Breakthrough' could be Human League at their very best. 'Rise And Shine' is yet another rousing anthem that should be mandatory listening whilst straightening the skirt or tie before work. Most of all, these tunes are paeans to love lost, love regained, and love affirmed not only in personal relationships but in human kind. It's both expansive, uplifting and totally convincing. Sometimes home-spun albums by musicians who are good in their particular fields (in this case dance and TV signature music) don't quite happen. 'Public Symphony' is a happy exception. There are a few albums around now that may vie for 'Best Of 2006' This is up there with the best of them. I'm afraid we don't offer six star ratings but, my goodness, this one is nudging it and then some. Tremendous. © 2006 Public Symphony. All rights reserved.